Buying Waste Vegetable Oil on eBay - or anywhere else! BEWARE - It might not be oil you're getting! I love eBay, I really do. There's bargains galore and you can find things there that you can't locate anywhere else. Brilliant! 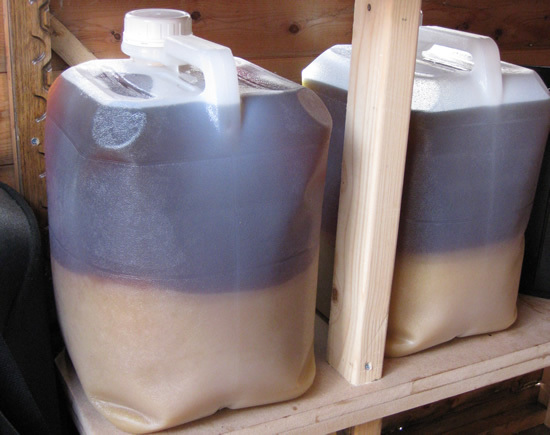 Unfortunately eBay has it's share of unscrupulous traders who, whilst breaking no law, will happily exploit your ignorance, and this is very apparent when it comes to those devious individuals selling Waste Vegetable Oil (WVO). You are bidding on 30 litres of waste vegetable oil. Grab a bargain! These are typical of the images I've seen on eBay and other auction sites. In this image (which is mine I hasten to add, and not one taken from a real auction), you can see a "sample" of the WVO for sale. Sure enough you can see two 15 litre containers full to the brim with WVO. This is an apparent truth... The problem is only about HALF of this is useful. The top half, the dark brown section, that's oil. That's the stuff you want. The bottom half, that's animal fats and all manner of rubbish. You CANNOT use that. So, are you bidding on 30 litres of WVO? Yes in the technical sense, but no in reality. In actuality you're bidding on around 15 to 18 litres of useable oil. It really upsets me to see people get involved in a bidding competition thinking they are saving money. They're not. Let's say the winning bid of my pretend auction was £30. On face value that's only £1 per litre, a true eBay bargain, right? Wrong. Because as I said there's only around 15 litres of useful oil there. So actually you've paid £2 per litre. At the time of writing this £1 or so a litre is about even with shop prices for virgin oil, and diesel is around £1.40 at the pump. So in this fake scenario you've spent too much money and you're still left with the hassle of filtering the stuff and getting rid of all that nasty fat! Make sure there's a picture of the oil you're buying. Contact the vendor and make sure this is an actual photo and not one he used on a previous auction. See if you can see the fatty deposits. Calculate based on these images exactly how much usable oil there really is there. Look for "pre-filtered" WVO rather than unfiltered. There are good-guys out there selling the usable stuff minus the fats (I sometimes do this myself), so read the description carefully and contact the vendor to make sure they've removed all the nasty stuff. Don't get caught up in bidding. Based on current shop prices, work out what a reasonable price is for the oil. Factor in the hassle of filtering, etc. Then bid up to that figure and NOT beyond. If someone out bids you, know that you've lost to a fool. Pity them, but don't envy them.